Hello! 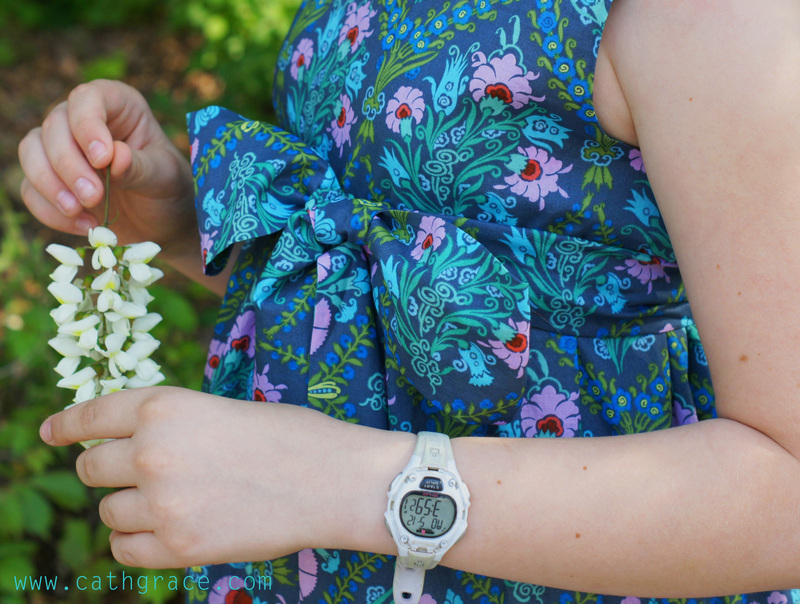 My name is Catherine and I blog over at www.cathgrace.com, I am a mother of 2 who lives in S. Korea with my military husband. I absolutely had a blast during my season on PR&P, and "met" so many awesome people, I always jump at any chance I get to visit over here! Thanks liZ and Elizabeth for having me again, you guys rock! 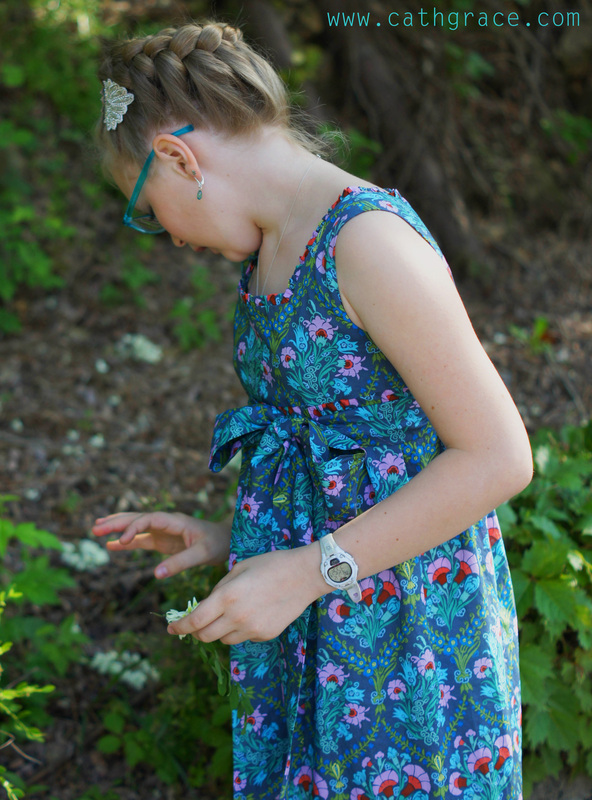 I'm finding my sewing is evolving as my daughter grows; she is only 11 still but wears about a size 14, so making a connection between her growing body, but her little girl's mind, is constantly a challenge! 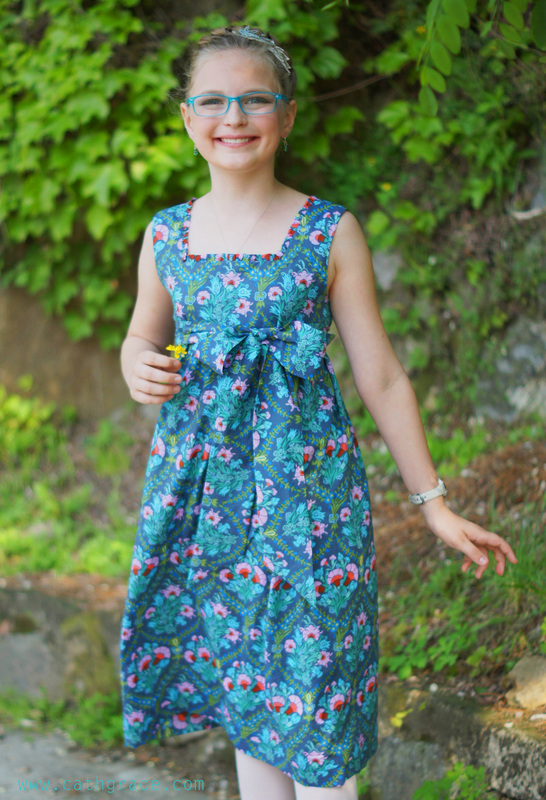 For Emmie's spring formal wear dress I began with 2 yards of the most stunning cotton lawn, in an Amy Butler print. The fabric is so soft, and drapes so beautifully, I knew simple was going to be better as far as the design was concerned. 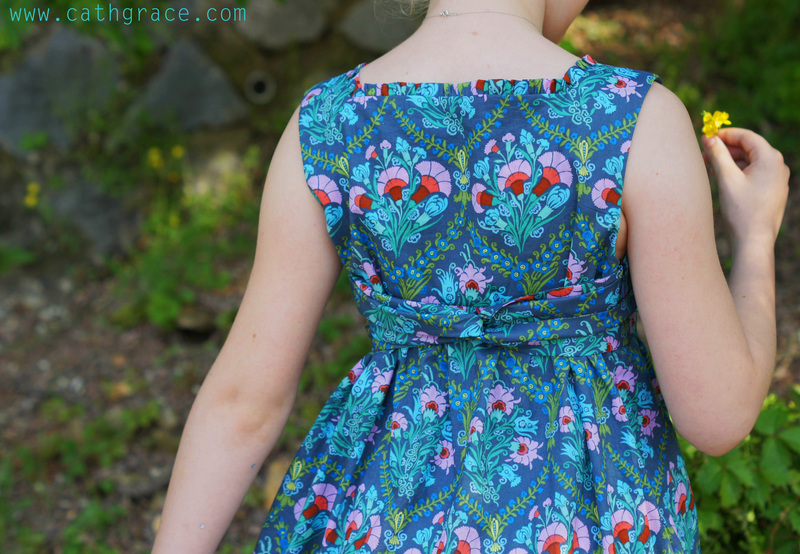 The dress has a high waist, with a 1/4" ruffle at the neck, and side ties that cross over in the back to turn into a sash and bow at the front. The skirt is only made out of one width of fabric, so it is not overly full, which I think helps add to the big girl look of the dress. As an aside, Emmie's figure is starting to change, and I'm stuck in the middle somewhere where princess seams draw attention to any...... development, but a flat body doesn't quite work either, so I have to be careful to accommodate her, without drawing extra attention, this theory extends to fabric placement too, I very carefully made sure to have a center motif, rather than centering a flower over each side of her chest. 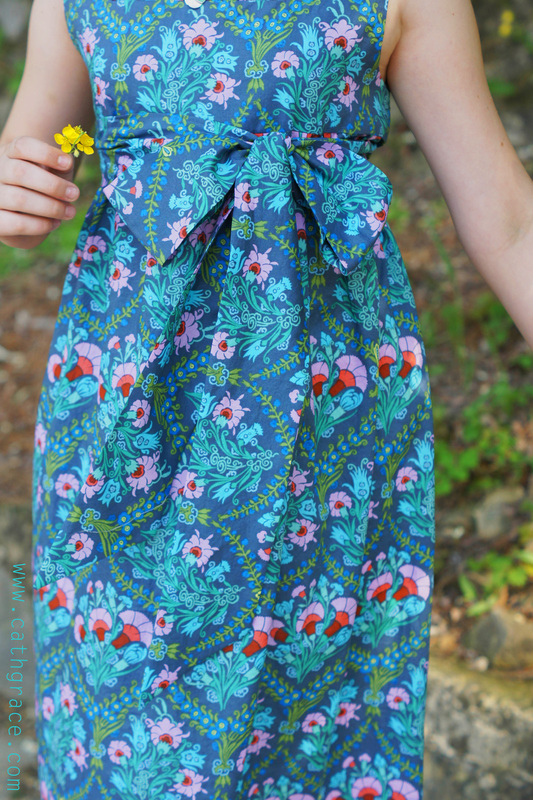 The small ruffle adds a lot of detail I think, without competing for attention with the heavily patterned fabric. 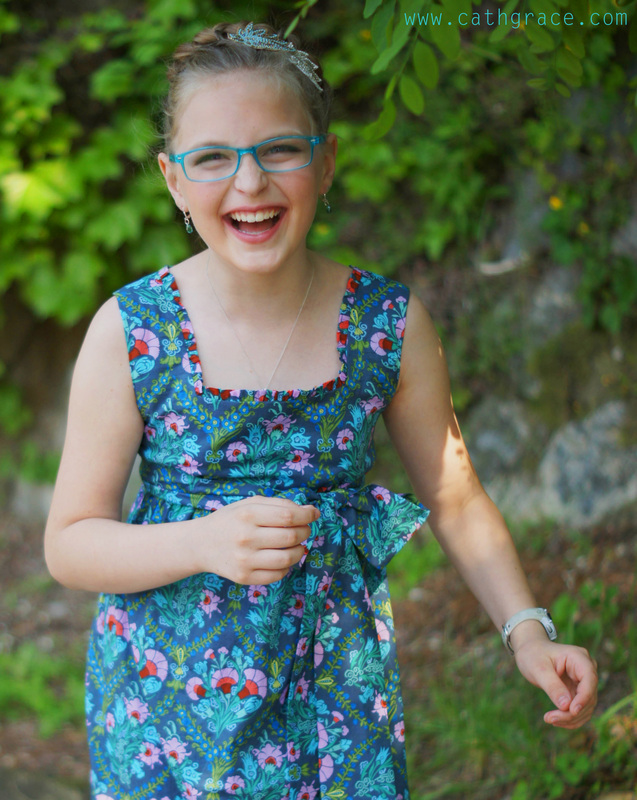 I love this dress for a big girl spring dress, it still reads "child" to me, while not being a princess dress. 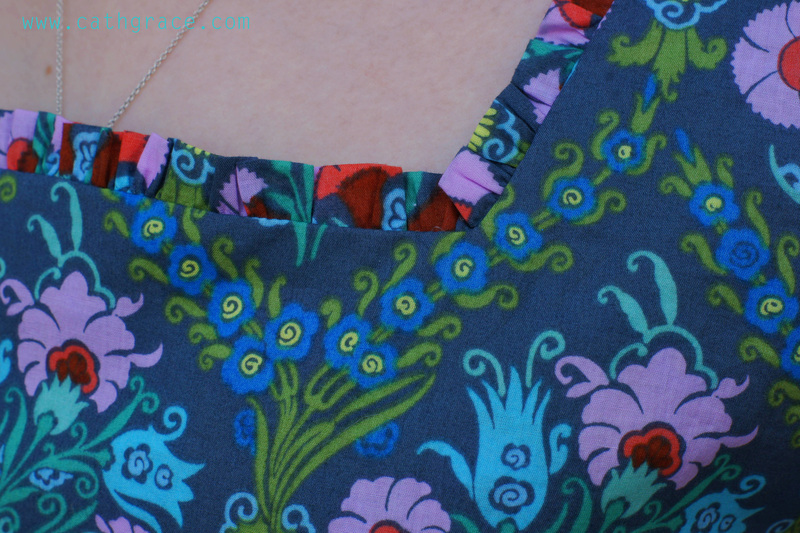 You can't see it, but the dress closes with a hidden side zip, so it is easy to put on. They are actually some I replicated from a company I love (Joyfolie,) I made these to be a knockoff of their Londyn shoes (as seen in this pin on pinterest) A. because goodness were the originals expensive for my budget, and B. because sadly, my little girl's feet are a size 8 now, yes, in WOMEN'S sizes..... so no, the Londyn shoes don't come in her size. 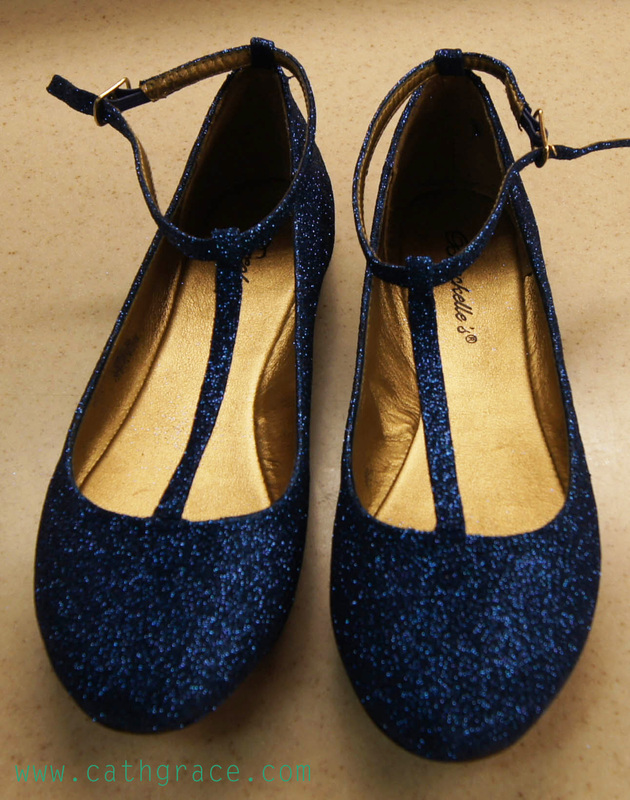 which makes them look like a VERY near match to the Joyfolie shoes I was knocking off. 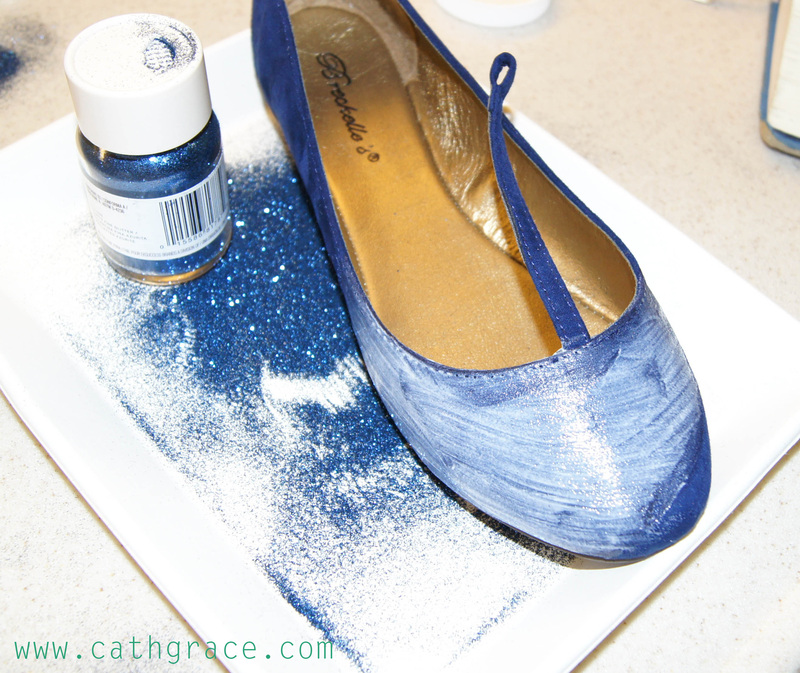 Would you like to make your own glitter shoes? 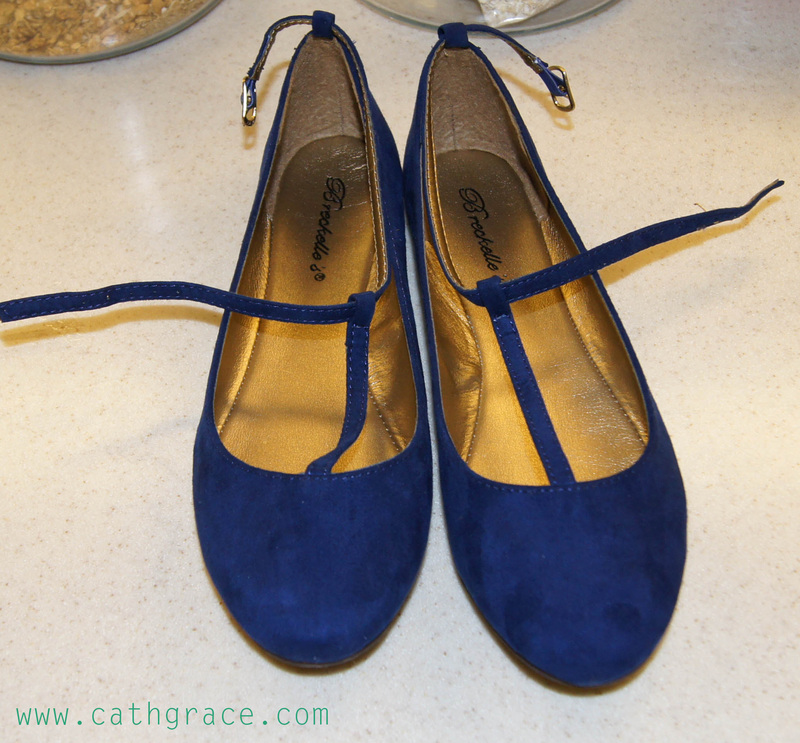 I began by finding the closest pair of t-strap shoes I could on amazon (we do a lot of amazon shopping here in Korea) I got really lucky and found this pair in royal blue fabric for $18. I also ordered fabric Mod Podge at the same time since there aren't really any craft stores here in Korea to speak of. 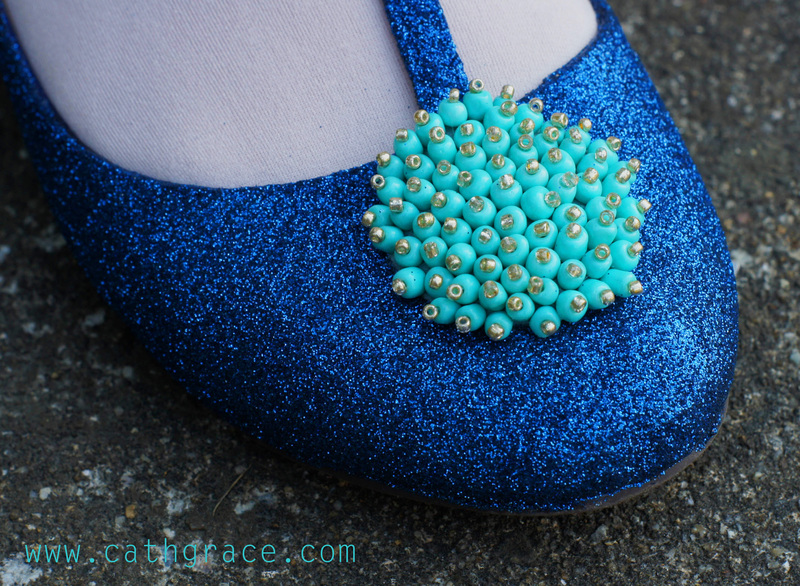 I began by pulling the ankle straps out, and spreading the Mod Podge on the shoe. I was careful not to go onto the sole rubber, or inside the shoe. I used a beautiful Martha Stewart ultra fine glitter, to get such a great color match. 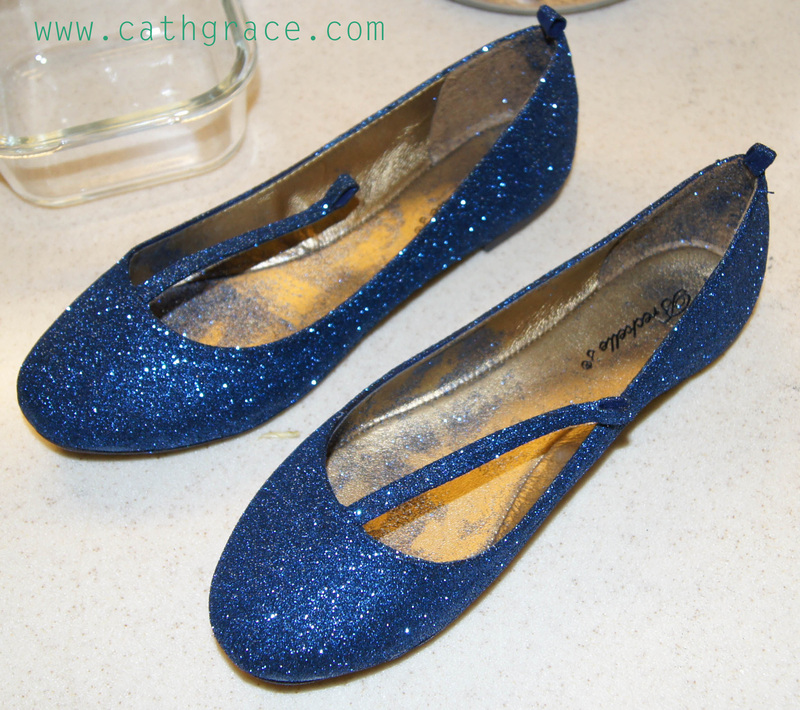 After coating the whole shoe in glitter, I set it aside and let it dry, I also coated the straps in glue and glitter. 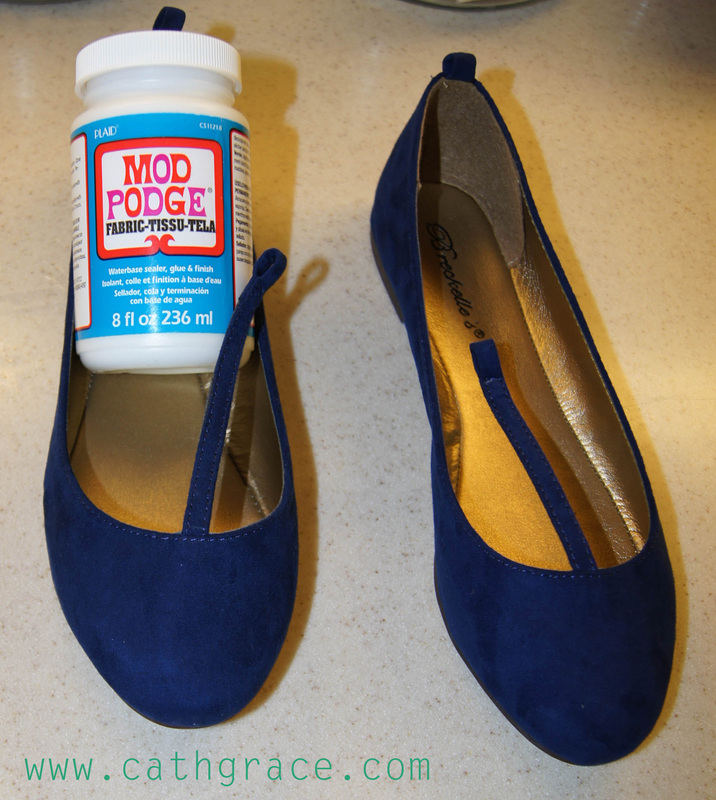 Next I painted on a second coat of Mod Podge, and gave the shoes a second coat of glitter, I wanted to be EXTRA sure they were covered well enough. after letting the 2 coats dry, I used the brush attachment on my vacuum, to vacuum off all the loose glitter. 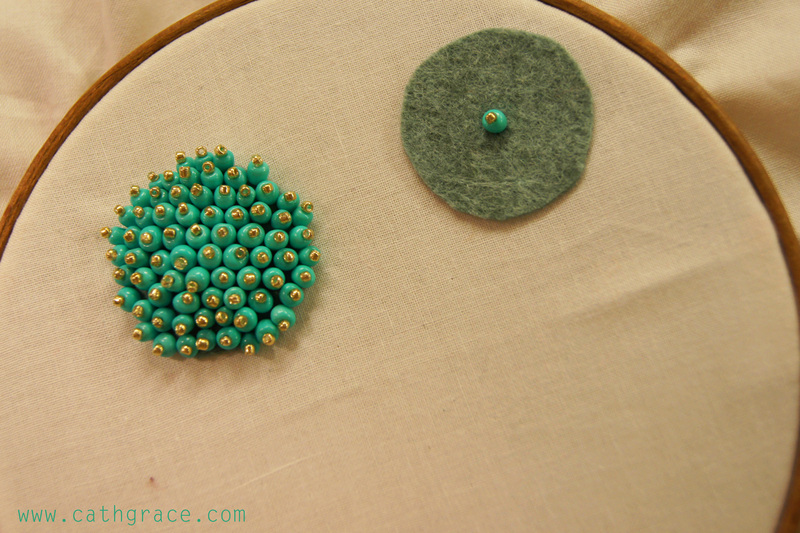 I sewed through a large turquoise glass bead, through a small gold seed bead, and then back down through the turquoise bead again. (using a clear nylon thread.) I knotted between beads in order to make sure it was very secure, and that everything wouldn't fall off or come undone if a strand of the thread snapped. 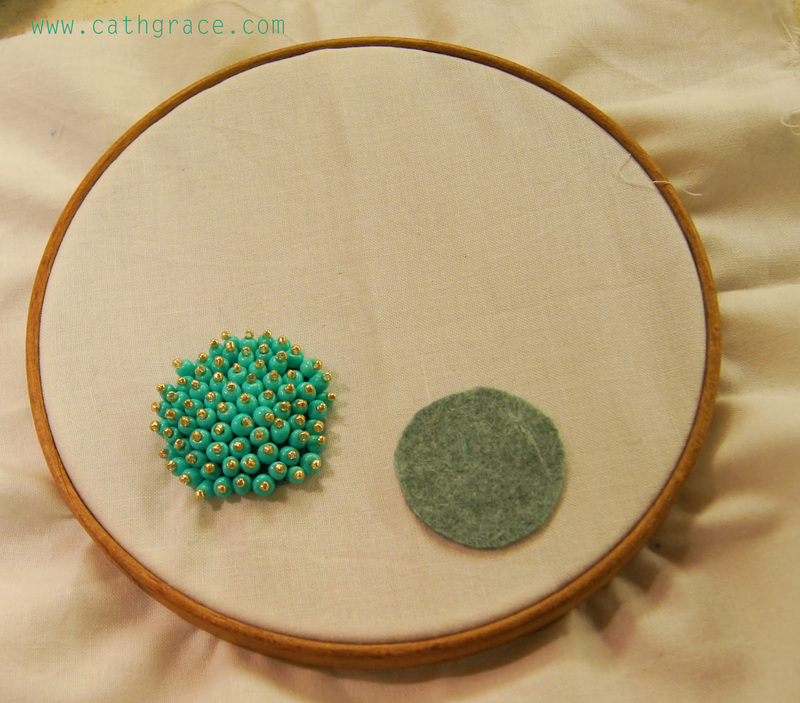 I pretty much packed as many as I could onto each felt circle. Then I cut as much of the cotton away from the back as I could, without cutting any threads. 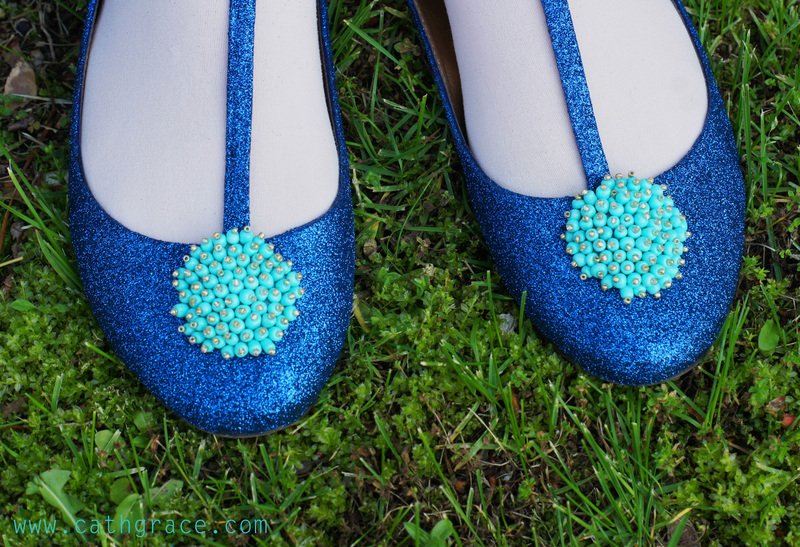 I used Aleene's tacky glue to spread allover the back of the beaded circles, and then pressed them onto the top of each shoe and smoothed them down nicely (enough glue to firmly hold it, but not squirt out the sides. The glitter is really secure though, and you can rub your hand over it, and not get any glitter on your hand. 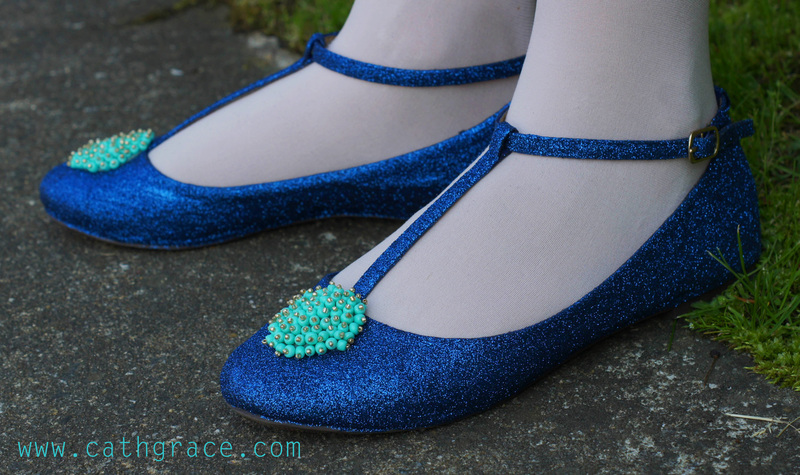 I really LOVE how these turned out, and Emmie is over the moon, that she gets to have such pretty little girl shoes, especially since they are hard to find in adult sizes. Thanks again for having me liZ and Elizabeth! 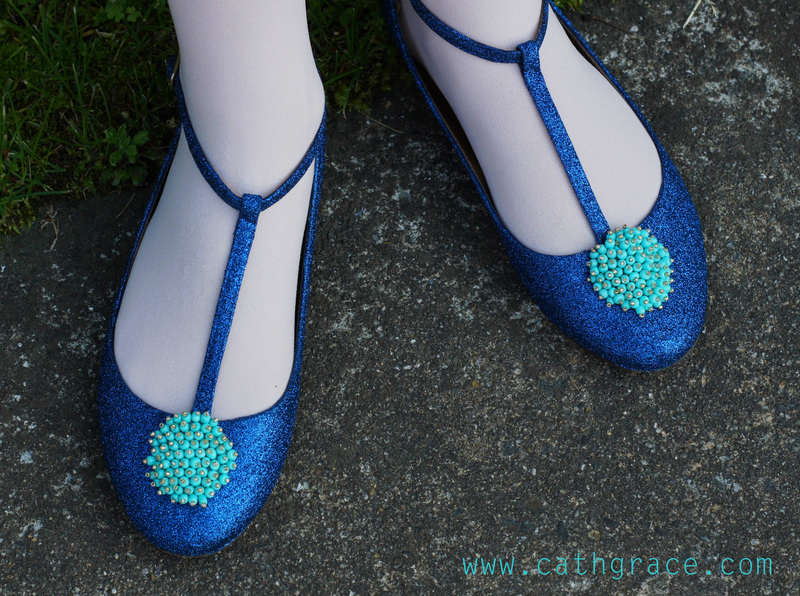 I hope you like my take on spring formal wear, including VERY fancy but budget friendly shoes :) I would love it if you would come and visit me over at cathgrace! This dress is stunning and I love the shoe craft. I tried to go to your blog but the links in this post all go to a 404 error. I googled and found your blog that way but I thought you'd like to know so you can fix these links. Thanks so much Kathy! I'll try and see if I can get liZ and Elizabeth to help me get that fixed! And thanks so much for your lovely comments! What a good mom you are. Love the look and how much you thought it out! 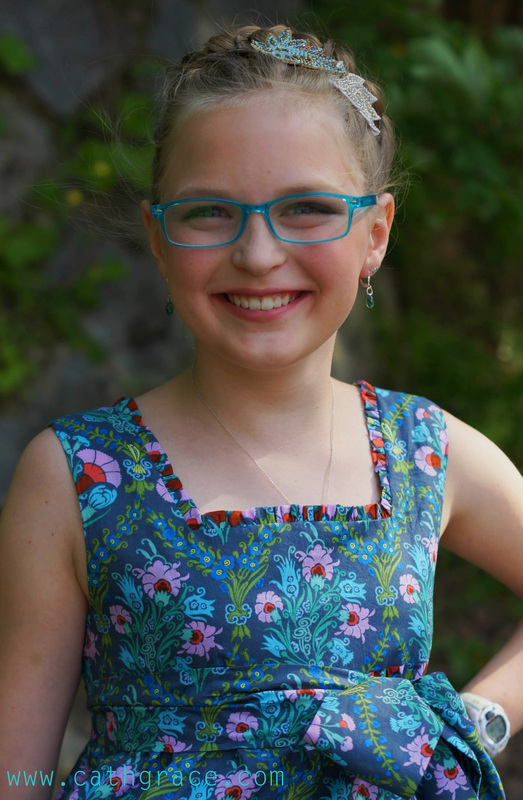 I have a grand daughter that is tall for her age, at only five we are already having issues with age appropriate shoes and clothes. Great tips. Gorgeous! I love all of it...fabric, dress (agree, skirt volume is perfect...not too full but full enough) and shoes. She looks so happy with it! Wow! This is fantastic! Beautiful fabric, beautiful dress and beautiful girl. Love it all. Thanks for the detailed description on how to make those fabulous shoes! Wow these are amazing. Dress, shoes and little lady looks perfect. How lucky! You did an amazing job ( as usual)! 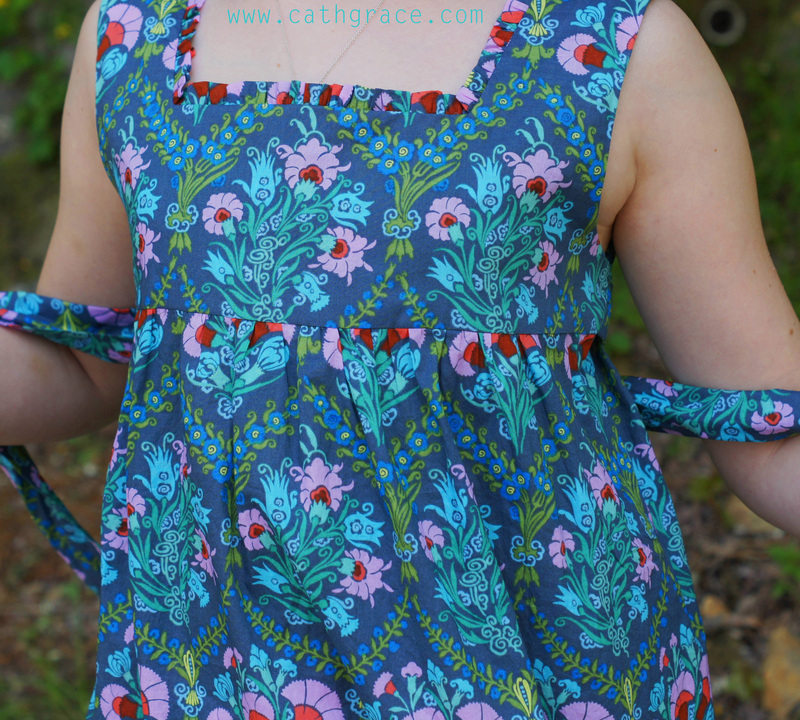 I love the look of this big girl dress, without it being too old for her. And those shoes!! THOSE SHOES?!!??!! Nice, Gorgeous! I love all of it. This Dress fabric are so good.Also Shoes. She looks so happy with it!